On May 18, 2016 the Department of Labor (DOL) issued a final ruling on the Exemption requirement. This new rule will effect a wide variety of businesses and employees. Our firm does quite a bit of work around compensation. What we find is many employers aren’t categorizing their employees accurately to begin with but this new ruling will offer the opportunity to review your current employees, their duties, and ensure appropriate classification between “exempt” (exempt=not eligible for overtime) and “non-exempt” (non-exempt=eligible for over time at one and half times the hourly rate of hours worked over 40 in one week). “Burden of proof” has always rested upon the employer/business to justify why they make the decisions they do regarding employees. Classification is not a new area that is immune to DOL scrutiny. DOL has always concerned themselves with regard to “are you (business owner/employer) paying employees as exempt, salaried, when they really should be (based on the amount of pay and the duties they perform) in a non-exempt, hourly role”. The findings have always proven quite costly if in fact, an employer has improperly categorized an employee as an exempt worker when they in fact should have been non-exempt. The costs to employers could include up to 3 years of back pay for the employee who worked on average 20 hours a month of overtime over that 3-year period. Do the math business owner, it would have been more cost efficient for you to get it right the first time! What should employers do now? Now is the time for businesses to review all of their employees and their current classifications. The new ruling will take effect December 1, 2016. While the duties test remains the same, the new ruling on the salary test sets a standard of $913 per week or $47,476 annually (a change from $455 per week; $23,00 annually) in order to be considered exempt. 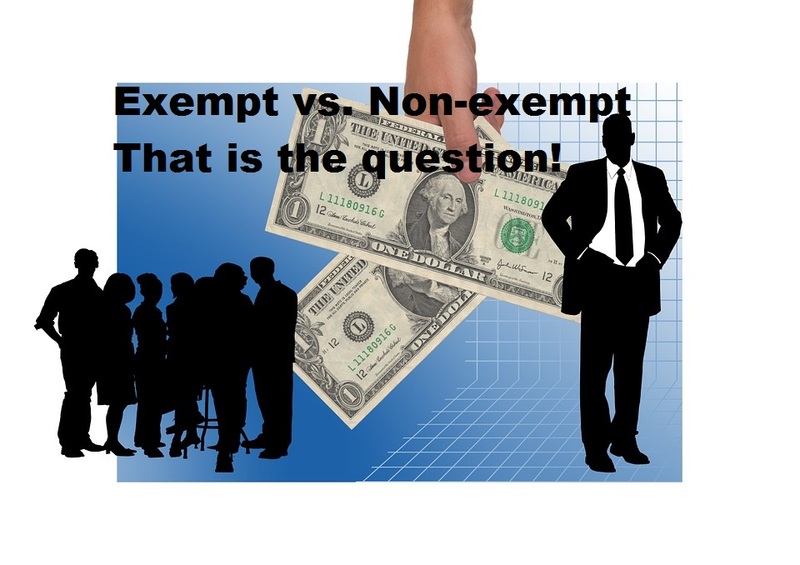 There are exceptions to the exemption status (as there always has been) to include executives, administrative, professionals, computer, outside sales and highly compensated employees. These exceptions have a variety of nuances to consider and can be tricky if you are not familiar with all of the tests in each category. As well, title is NOT a reason to justify why a business has put an employee into a specific class. Rather, there are a variety of things to consider and we suggest starting with reviewing the ‘primary duties’ of the individual. From there, the business should evaluate how and what they are paying employees including the amount of pay equal to the new DOL standard. If the outcome of the research lends to making a change to an employee’s status from exempt to non-exempt, establish the new time reporting procedures and policy about over-time (whether it should be pre-approved by a supervisor), communicate it to the affected employee(s), then document the status change in writing and file it in the employee’s file.